Conference Oxford is delighted to announce its membership of the Meetings Industry Association (mia), one of the fastest growing associations in the conference, meetings and events sector. 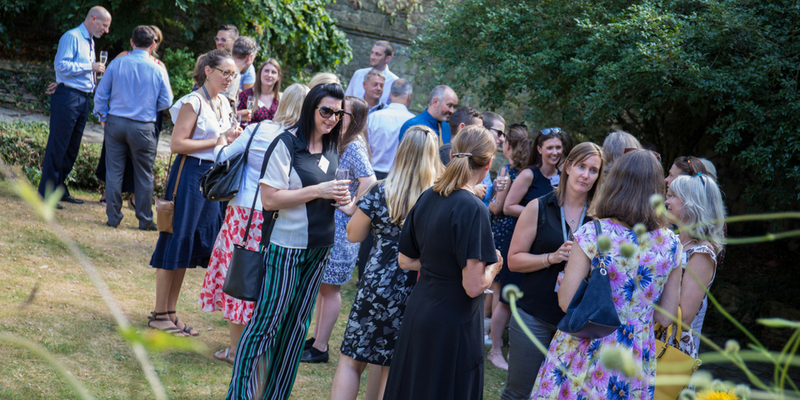 To launch its membership, Conference Oxford held a party in The Master’s Garden of Pembroke College on Tuesday, 24th of July. Over 50 guests, including representatives from the newly-accredited venues, enjoyed a sparkling reception with canapés and a cake specially made to mark the occasion. In addition to their new membership, Conference Oxford venues have achieved AIM accreditation. AIM is the UK’s only nationally recognised accreditation scheme for the meetings and events industry. The accreditation process looks at all the facilities and services offered by venues and acts as an assurance of quality and professionalism to event organisers looking to find the perfect venue for their event. Conference Oxford provides a central point of contact to anyone wishing to book a conference, meeting, celebratory dinner, an award ceremony, party or wedding at one of their 65 University of Oxford and college venues. The service they offer is free and available to everyone. Events can be held in some of Oxford’s iconic buildings, blending historic architecture with modern facilities resulting in memorable events. With excellent transport links and a vast array of inspiring venues to choose from, Conference Oxford offers the perfect location for any event. Marie O’Connor, Head of Conference Oxford said: “We are delighted that so many of our wonderful academic venues have achieved AIM Accreditation, highlighting the high standard of their facilities and conference teams. Our venues have worked extremely hard to demonstrate to the rest of the events industry that Oxford University is a leading conference and events destination. We are looking forward to a long and fruitful relationship with the Meetings Industry Association”.